I spent a day tracking my expenses in the lovely town of Copan Ruinas. 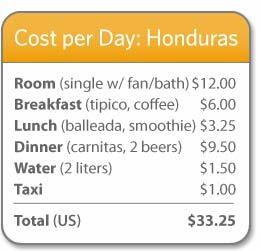 Prices here seem to be about average for much of Honduras, though the larger cities and islands are noticeably more expensive. Room — I’m staying at the La Posada de Belssy, near the main square for $12 a night. For that I get a small clean room with fan, bathroom and a hot shower. Wifi is included and there’s a nice rooftop patio with hammocks and a good view. It’s a good value place to stay. Food — Meals can get expensive here, relatively speaking. A plate at a sit-down cafe can cost $6-10 easily, which seems high when you’re only paying $12 for a hotel. I normally just grab coffee and a baleada (a huge soft taco with beans, cheese and sour cream) but today I woke up starving so I had the tipico breakfast at ViaVia, a popular backpacker cafe and hotel. For $6.50 I got 2 eggs, refried beans, fried plantains, cheese, avocado, tortillas and coffee. A 10% tip is the custom here and is included in that total. For lunch, I just grabbed a baleada with beans and beef for $2 and had a orange/pineapple smoothie for $1.75. Dinner was a fantastic grilled beef plate from Carnitas Nia Lola for $7 — it was more than I could eat and could easily feed two. Honduran beers cost $1.50 at most places and I had a couple Salva Vidas as I watched the sunset. Transport — Copan Ruinas is a small town so I really just walked everywhere. I did get caught in a rainstorm and grabbed a local tuk tuk taxi — they’ll run you just about anywhere in town for a buck. I did have one offer me a ride to the Copan site for $10, hoping I didn’t realize that it was only a 10 minute walk. Bus trips around the country vary widely in price. Large, comfortable buses can carry you from the capitol, San Pedro Sula to Copan for about $6 if you’re willing to go without AC (keep in mind that this distance is about halfway across the country). For a cooler ride, you’ll have to go with the Hedman Alas luxury bus service and it will cost about four times as much. A 12-seater van service will take you to Antigua, Guatemala for $20 and 6 hours of your time. Miscellaneous — There are tours and such available but I never seem to go for that sort of thing. The nearby ruins are $15 to visit and well worth the money, though I didn’t visit them on this day. Bottled water costs about $.75 a liter — ViaVia cafe will refills your bottles with filtered water for about 10 cents a refill, a nice service. One expense I’ve trimmed from my budget is cigarettes. My friend Aisha is a hypnotherapist and was kind enough to gift me two one-hour sessions. I always thought I was too stubborn and set in my ways for hypnosis to help but I can honestly say I walked out of her office a non-smoker with no need for nicotine gum. She’s based in Austin at Wellspring Hypnosis and Healing Artsand has MP3′s available on her website — highly recommended if you’re trying to quit smoking or lose weight. I’m a believer. All in all, I spent $33.25 for the whole day — not as cheap as I would like but not too bad. I could have easily cut $7-8 off that by eating more cheaply but after spending time on the island of Utila, where food was about 25% more expensive, I just couldn’t resist living it up a bit. There are a couple of hostels in town, too, where I could have saved another $5 on housing but I like having my own room and the view from the rooftop at the Belssy was quite lovely. I guess you would have spent much less if you bought groceries from a market and prepared you own food huh. You crazy spend thrift, just kidding. Sounds reasonable and easily could be $20-$25 if not all meals at restaurants. Looks like a cool place, how much linger you plan on being up there? Leon, Niaragua where I am now is around the se I’d not a little less. 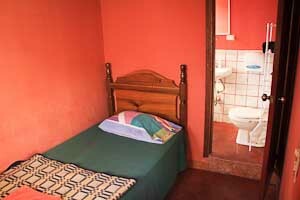 No private rooms with own bathroom for $12 though. Yeah, I had thought the same. Skipping sit down meals can save a lot. If you’re willing to stay in rooms without bathrooms, etc, you can shave more there, too. Good stuff. It is interesting that the nice room is 12, where as a regular meal is almost the same price. I guess I could save money and go on the Honduras weight loss diet if I was there, heh. I’m surprised to see that meals weren’t cheaper. Yeah, you really have to eat on the street here and there usually aren’t too many options. Fried chicken, balleadas and…. $.10 for a water refill is great for the wallet and environment. Impressive — especially the $12 room. And $1.50 for beer — awesome. This was one of the biggest changes in my life and although my quitting was a white-knuckled, painfull experience I dont regret it for a minute. Thanks for this post, I love reading budget breakdowns! I did a full breakdown of my budget after a two week trip to Honduras (http://www.alexinwanderland.com/2011/08/03/honduras-travel-budget-breakdown/) and many of your readers would be horrified to see that we spent an average of $56 dollars a day each! However, we were sticking to the pricier Bay Islands and we jammed those two weeks with so many activities, from diving to whitewater rafting to attending Sunjam festival. I don’t regret a cent! In the end everyone’s travel budget will be different, but these posts are great for showing a baseline. Keep posting! I was thrilled to spend it! If we were traveling a bit longer it probably would have averaged out to less per day but when you are only there for two weeks, you want to do it all! Great post! You had us at 1.50 beers. haha. Can’t wait to trek down there in a couple of months! I really enjoyed Honduras, though I only got to see a bit of it. Considering stopping back by on my way south. San Pedro Sula has nothing to offer, other than being a transport hub — get in and get out. Congratulations on being a non-smoker! I am proud of you. I am just finishing six months of travel in SE Asia. I am leaving Bali in ten days and returning home to Austin. Your blog has been a great resource and entertainment on my travels, esp. the gear section. Do you recall if there were ATM fees when withdrawing money from the ATM? Always. I didn’t make a note but it’s generally in the $1-2 range in most places I’ve been. I go all the time; favorite place on the planet. Best time to go is between now and October. They’ve had some rain recently but it’s been good the past couple of days and should remain so for awhile. Easter is not the best time as many people from the mainland spend the week on Roatan and it’s really crowded. Great post and just what we needed to plan our trip to Honduras. With Central America being about double the price of Asia and travelling as a family of four it certainly adds up. Knowing what to expect before hand is a massive help.